Welcome to our Jargon Buster – an ever-evolving elearning glossary to explain online learning and training industry terminology – to keep close by as a handy reference. Keen to learn more about the latest in elearning technology and techniques in 2019, but don’t know your AICC from your xAPI? Don’t worry – we’re here to help. One of the key benefits of elearning is the ability to make the learning experience available any time and anywhere – often suiting hard to reach learners and the training of staff outside of the workday. A model for Learning and Development where 70% of learning is experiential (sometimes known as ‘on-the-job training’), 20% is through others (peer to peer or social learning) and 10% is from formal coursework and training. This a broad, research-based framework for facilitating optimal learning, often attributed to McCall, Lombardo and Eichinger from their studies 1996. However, Charles Jennings, Co-founder of the 70:20:10 Institute, has been the most notable proponent of this formula for eLearning and L&D in recent years. Often refers to a characteristic of technology that enables people with impairments or disabilities to use it. For example, accessible online materials can be navigated by people with visual, hearing, motor, or cognitive impairments. Accessible design also benefits people with older or slower software and hardware, while eLearning by its very nature enhances accessibility of learning content for remote learners or those who are unavailable during standard education / training schedules. This is a standard for elearning content which guarantees it will be compatible with an AICC compatible LMS. It was designed by the now defunct AICC for computer based training in the aviation industry. It is rather like SCORM in principle, but many people thought it was more transparent, robust and secure. See SCORM. The AICC were responsible for work on an standard called CMI-5 based on the xAPI or Tin Can framework standard. Application Programming Interface. An interface for letting a program communicate with another program. In web terms: An interface for letting web browsers or web servers communicate with other programs. Computer-based solutions used to systematically evaluate a learner’s skill or knowledge level. With the growth of eLearning has come the need for remote invigilation of exams and systems to facilitate this process, which are sometimes known as Remote Proctoring software. If learners study online training courses at different times, the process is known as asynchronous learning. This freedom to learn without the time constraints of the traditional classroom environment is one of the key elearning benefits. Asynchronous learning is a learner-centric way of delivering training, allowing study any time and anywhere. This can be defined as a voice-only connection across three or more locations via a computer using VOIP (Voice Over Internet Protocol) or by telephone. Audio conferencing can be a way of facilitating group, tutor-led group conversations that supplement other forms of elearning. These are software applications, typically used by instructional designers, to create elearning content. Popular types of elearning authoring tool include desktop software, such as Articulate Storyline, Adobe Captivate or Trivantis Lectora, cloud based tools that are subscribed to on a Software as a Service (SaaS) basis and that these days export in HTML5 format, and various Microsoft PowerPoint plugins. Bespoke content is developed to order – solely for the needs of the purchaser. Unlike off-the-shelf content, bespoke elearning often takes into account not only the subject matter of the content, but the unique working practices, IT systems, and even branding of the organisation. The benefits of elearning are numerous, with cost saving, convenience, accessibility, multimedia engagement and track-ability just a few of them. However, the traditional, face to face training environment still has its place for practical skills development, team building and more. As the name suggests, blended learning is a combination of elearning and the in-person, classroom environment. The concept of elearning branching is where the consumed exercise content can vary based on decisions the user makes. This is fundamental to Games Based Learning and important for immersive training such as systems simulations. Read our blog post on elearning branching scenarios that includes more about what they are and how to make them both effective and commercially viable. A new advanced elearning standard which uses the Tin Can or xAPI standard, which in turn was based on SCORM. A work in progress. Also referred to as CBT, computer based training refers to any course that relies on a computer. A decade or more ago, the content may have arrived on a CD, but it’s increasingly common to distribute learning content over the Internet. However it arrives, the trainer does not need to be present. Software or other materials designed for use in an education or training course. Also known as Distance Education. Distance learning occurs when student and teacher / instructor are in different locations. Distance learning has been around since long before the Internet and the presence of a computer in nearly every home and office, so it used be an asynchronous form of learning. With the Internet and mobile telephony, distance learning can now be both synchronous and asynchronous – or a combination of both. Short for ‘electronic learning’, eLearning is any kind of education or training that is accessed via a digital device. As so much elearning now happens over the Internet nowadays, the term is largely synonymous with web-based training (WBT) and computer-based training (CBT). These are principles which eLearning systems and content can adhere to for the greater good. SCORM is an example of a standard which guarantees (in theory) the interoperability of an LMS and the content you place into it. There are also standards such as IMS based around XML, designed with the goal of increasing transparency, enabling easier collaboration, and reducing vendor lock in. Mighty Fine. Also known commonly as the Flipped Classroom in the field of education, flipped learning switches the lecture / instructional element of learning away from the face to face environment to the learner’s own time, allowing them to take in information at their own pace. Face to face education and training environments can then focus on discussion and interaction, facilitating lively debate. education or training content organised into a gaming structure from the outset. This will include an end goal or series of goals, usually with milestones that offer rewards and positive feedback for achievement along the way. In the context of eLearning, Gamification takes a set of learning content and activities that do not naturally comprise a gaming element, and adds a layer of game design theory and mechanics in order to boost learner motivation and achievement. There is overlap and frequent confusion between the two terms above – our post on Gamification vs Games Based Learning might help. This sort of elearning places individuals in a virtual interactive learning environment, so as to replicate possible scenarios or/and to teach particular skills or techniques. Simulations, Roleplay, virtual learning environments and virtual reality (VR) can be considered immersive. This is education / training that happens outside of a structured instructional environment. Much learning happens through the natural absorption of knowledge from one’s surrounding and proponents of the 70:20:10 principle suggest that this accounts for 90% of learning, with only 10% being from formal training. Starts with the training needs and goals of an organisation and an understanding of the knowledge and skills gaps that learners need to work on. Instructional design bridges those gaps though the development of training experiences and is based on sound psychology, learning delivery best practices and use of the latest technology to deliver an effective, engaging experience. One of the key professionals involved in the creation of elearning content. Typically, an instructional designer will be briefed on the business and training needs, and will use his or her understanding of the students’ existing knowledge and skills to create learning content for courses. practices the craft and science of instructional design. Content development software such as Adobe Articulate or Storyline are now popular parts of the toolkit for multimedia content creation. Also known as ILT, instructor led training happens in a classroom environment – with instructor and learner together at the same time, in the same place. Aside from some rather whizzy concepts bearing this name – this is pretty straightforward. Interactive eLearning places an emphasis on user interactions throughout the exercises to enhance engagement and immersion in the subject. This sort of training can also demand decision making, branching and role based thinking and forms the bedrock of the scenario based approach to training. In the context of elearning, learners to provide input within an online course in the form of selecting options, completing quizzes etc, and receive feedback as a result. Interactive multimedia is present in many other fields, notably Gaming – an industry that has a major impact on the elearning industry in terms of engagement theory and best practices. A rather general term that refers to the underlying technologies people use to build and deploy elearning. It usually refers the authoring software, the Learning Management System (LMS) or both. 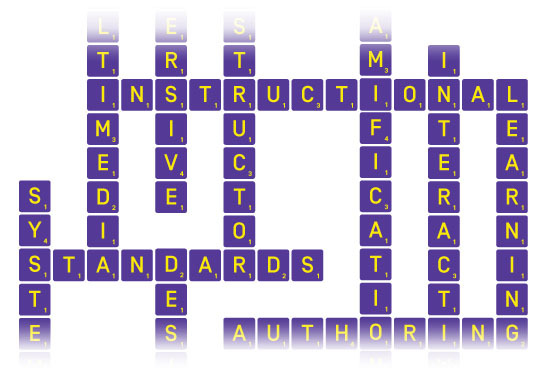 An acronym for Learning Management System. An LMS is software that manages the administration of training. Typically includes functionality for course catalogues, launching courses, registering students, tracking student progress and assessments. The Learning Experience Platform or LXP is a relatively new concept in the elearning space. The idea is that while the LMS tends to be employer-centric as a place to manage essential training for onboarding, compliance etc, the LXP is learner-centric – a place where employees should want to go and learn of their own accord, because the environment is enjoyable and enriching. Content may be curated from a range of external sources based on potential staff interests instead of, or at least in addition to, in-house training needs. Some industry commentators are describing such a system as a Learning Engagement Platform or LEP. Many define LXP / LEP as being like Netflix for learning content, with key attributes being a slick UI, easy search functionalities and content recommendations based on user preferences and behaviour. These platforms are typically an add-on to an LMS, but we’re likely to see the lines blurred between LMSs and LXPs / LEPs over the next few years, as employers will want the simplicity of an all in one solution. Sometimes known as mLearning – mobile learning takes place on a handheld device, such as a mobile phone or tablet computer. This is the most accessible form of any-time, anywhere learning. A cognitive theory – multimedia learning is based on three main assumptions: there are two separate channels (visual and auditory) for processing information; there is limited channel capacity; and that learning is an active process of filtering, selecting, organising, and integrating information. This theory was first popularised by Richard E Meyer in his book, Multimedia Learning, published in 2001. Often called ‘Generic’ or ‘Ready-to-Go’, Off the Shelf content has been developed to be useful for a relatively large user base across multiple organisations. The opposite is bespoke content that’s made to order for a specific organisation. Off-the-shelf elearning covers a certain area of knowledge or skill that could be relevant to multiple customers. Frequently used synonymously with elearning and meaning the same as web-based training, online learning describes education or training where materials are distributed, and communication takes place, over the Internet. In eLearning this term usually refers to exercises which involve at least 2 people who are asked to complete interactive tasks facilitated by a computer program. As the names suggests this normally involves the people involved being invited to perform roles e.g. Customer and Assistant being a natural one. It is a natural extension of the scenario paradigm and can fit well with system simulations. We talk more about roleplay here. A Scenario is a framework for exercises, where the learning experience is hung around a realistic situation or story. It presents an exercise where the student is invited to imagine a situation and is sometimes called immersive learning. Read our post on creating scenario based training with eLearning to learn more. In learning scenarios are often referred to as instructional scenarios. Sharable Content Object Reference Model – Now there is a mouthful. SCORM is a standard followed by most content authoring software and most LMS’s. In a nutshell SCORM compatible content will play nicely on a SCORM compatible LMS. SCORM will also guarantee basic tracking abilities and management information for the content. There are different versions of SCORM and other issues, but this is basically what you need to know. SCORM does the bare minimum of what you really want for a serious eLearning set up, and this is often enough. See also xAPI and AICC. If learners are able to access and use education and training materials at a time that suits their schedules and preferences, this is known as self-placed learning. Without the traditional classroom timetable, learning is open to those with other commitments, such as paid employment or childcare responsibilities. In elearning a simulation is an instructional scenario where the learner is invited to interact with a facsimile of a real world object to help achieve learning objectives (intake of breath). The target object can be diverse as a computer system (see systems simulations), a complex device such as piece of machinery or a human body. A key goal of the simulation is to make the user interactions as realistic as possible given the limitations of the device the elearning will be running on. Social learning has been ever-present through human history in the form of copying others and sharing knowledge through any form of communication. Today however, social learning generally refers to knowledge sharing and the debate of training through online discussion boards or social media networks, such as Facebook. Social learning is the 20% in the 70:20:10 model. A framework for exercises where the training is accompanied by an unfolding story or narrative to help guide the learner and stimulate their thought processes. In elearning, this is highly similar to scenario based training, but with a focus on putting the learner through a precise journey. Whether in a face to face classroom environment or online in a live lecture or webinar, synchronous learning involves instructors and learners communicating at the same time. When people need to conduct education or training as a group at the same time, but being in the same place is not possible, it can be facilitated by virtual classroom software. True to life representation of an organisation’s in-house software or systems, allowing staff to practise using them in a safe environment. Learning of this type has proven to be highly effective with 90% retention rates as opposed to 30% for oral presentation. Read our blog post on effective system simulations in eLearning to learn more. Often the simulations are embedded in realistic scenarios and/or with plausible narratives. The successor to SCORM (aka xAPI). Essentially does the same job as SCORM but addresses a lot of the problems and weaknesses of the SCORM standard which was designed not long after 2000 when the web was in its infancy. It also introduces a host of new functionalities and complexity with that. So it is debatable whether it will really replace SCORM in the long run. One big advantage is that it supports content being played outside of the LMS. For example, on an app on a phone with an intermittent internet connection. So this is a benefit for mobile learning. Where a live education or training environment is created online and accessed via digital devices, this is known as a virtual classroom. Learners and instructors need to use the same virtual classroom software to communicate, and this might be downloaded as a desktop application or mobile app, or accessed online with cloud-based software. Virtual Reality is where the senses are taken over by technology to create a computer generated environment. It usually applies to vision – and deployed via the ubiquitous VR headset which has been a star news item since 2010. For e-learning this is a hot topic, but a tricky one since VR itself is still in its infancy with a lot of problems to overcome – in particular costs and standardization. A webinar is a seminar conducted over the Internet. Although sometimes made available as a recording, webinars are usually conducted live, enabling real time participant debate, with the sharing of diagrams, slides and other images, audio and other multimedia content. Also known as WBT, web-based training refers to any time of instruction where materials are delivered and communication happens primarily via the Internet. If you are not technical this acronym can crop up in elearning and be rather bewildering, but we shall mention it because it is genuinely a good thing. No, its not a programming language. It is a format for documents which means they can be understood by a human or a machine. This means the documents are inherently open and can be edited by anyone or anything. For elearning, if your content is based on XML then you are not tied to your vendors to maintain it. Trivantis Lectora gets a gold star from us for using XML. We use XML for Systems Simulation. Know of some more important elearning jargon that we haven’t yet explained here? Please contact us to give us the heads up and help us help others!